Click here to purchase this book $99. To succeed in today’s global marketplace and be competitive, exporters must offer their customers attractive sales terms supported by the appropriate payment methods, and importers must negotiate for the best terms fo sales from with their suppliers. Getting paid in full and on time is the goal for each export sale; an appropriate payment method must be chosen carefully to minimize the payment risk while accommodating the needs of foreign customers. 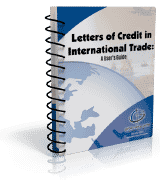 Letters of Credit in International Trade: A User’s Guide, is a handbook that you’ll want to keep at your fingertips. It is a reference book with explanations, definitions, and the full text of the International Chamber of Commerce’s Uniform Customs and Practice for Documentary Credits, UCP 600. The UCP 600 is a banker’s bible when letter of credit presentations are being evaluated. Checklists for sellers/buyers when evaluating letters of credit for amendments or whether to accept the letter of credit. John A Novak joined Bremer Bank N.A., Minneapolis, Minnesota as Vice President and Manager of International Department in December, 2004. John currently has responsibility for sales, marketing, training and consulting of all international services. Mr. Novak has more than 40 years of international finance and international banking experience that included working for Citibank in NYC, National City Bank, Cleveland, Ohio (now PNC) and U.S. Bank Minneapolis, MN. While at these banks, he managed and provided support for international operations and promoted sales.